Remember when Jack Lambert was quoted “Quarterbacks should wear skirts.” back in 1975?? Well with another rule change or two they may actually be doing that. What happened yesterday was a complete travesty that could wind up derailing the season for the San Franciso 49ers. 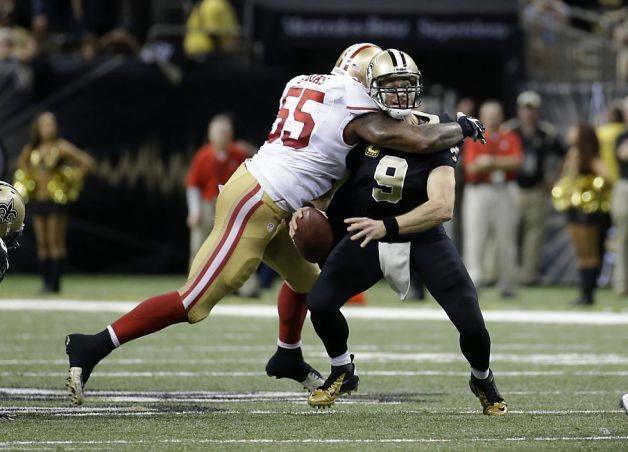 Drew Brees is about to be sacked by Ahmad Brooks of the 49ers. Toward the end of yesterday’s game between the Niners battle with the New Orleans Saints, the game had boiled down to a critical third down. San Francisco had played a brilliant game on the road and were about to put on the finishing touches on what would have been a 20-17 win. Up until the moment of the hit, the Niners had held Drew Brees to just 200 yards passing the entire game. It was 3rd and 2 from the San Francisco 35. Brees takes a Pistol snap and takes the equivalent of a seven step drop when Ahmad Brooks levels him. The ball comes out and Patrick Willis recovered back at the 48 with 3:17 to go. The first substantial drive of the fourth quarter by the Saints had been squashed and the Niners could run out the clock in a quiet Superdome….right?? Well there was a flag on the prescription turf. Brooks was flagged for hitting Brees in the head. Replay clearly showed that he hit him across the chest causing a fumble. Unecessary roughness was called on Brooks indicating he had hit Brees in the head. During the call we heard the ref describe “attacking the neck of the quarterback”. The Saints retained possession and thanks to the 15 yard penalty were in position to tie the game with a field goal, changing the momentum. The turn of events led to the Saints, thanks to the penalty were in field goal range to tie the game. Then the subsequent change of momentum stymied San Francisco’s last drive and New Orleans last second kick to win it 23-20. A travesty had occurred with the Niners losing that game. You didn’t go away feeling the best team won, you felt something else. The Niners hadn’t been cheated like that since the 1983 NFC Championship Game. The over-protection of quarterbacks is at an all time high and it’s ruining the game of football. On the play in question Ahmad Brooks came storming around the strong side and hit Drew Brees high but with his arm and shoulder across the chest. Because Brees wasn’t ready for it and didn’t brace himself causing a whiplash effect doesn’t make it a penalty. Brooks didn’t hit him in the head nor did he use his in making the tackle. Now thanks to a terrible call, the defending NFC Champions may not make the playoffs with a 6-4 record. They now have 3 conference losses and tie breaker advantages to several teams. If this is a roughing the passer penalty, I’m from Mars. Quarterbacks are playing the game of football too. 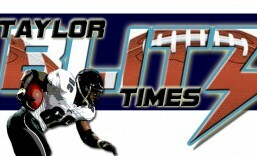 Personally, I like seeing quarterbacks knocked about, it’s one of the reasons you’re reading the Taylor BLITZ Times and not the Taylor Long Pass Times. We here understand the necessary measures but this is getting ridiculous. Thanks to the knee injury suffered by Tom Brady in week 1 of 2008, a falling lineman can’t do so into the legs of a quarterback. The league always had a rule where if the defender was reaching to knock down a pass and hit the helmet, it’s a penalty. Now the referee is worried that Brooks hit Brees in the neck when replay showed clearly he didn’t. Never knew a quarterback’s neck was off limits. By the time we put in quarterback hook slides and such….Jack Lambert was 100% right. Not only should they wear skirts, they should take off their shoulder pads and helmets also. This entry was posted in 2013 NFL Regular Season and tagged Ahmad Brooks, Drew Brees, Jack Lambert quoted "quarterbacks should all wear skirts. ", New Orleans Saints, NFL Players, NFL rules, San Francisco 49ers, sports football. Bookmark the permalink. The 49ers were completely cheated yesterday. Another “non-call” that bugged me in the game was blatant Pass Interference on Vernon Davis in the endzone on 3rd down that held them to a field goal on that drive. They had other chances to score, and couldn’t, but that probably would’ve been 7, 4 more being the difference in the game.